Every crime scene has clues if you know where to look, and with the correct techniques, you might just uncover the truth of what happened. 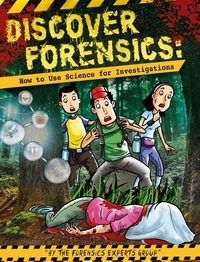 Moments like this are perfect for forensics to come in and save the day!In this book, experts will guide you to explore how everyday objects can provide vital clues to investigate questions. You will learn to debunk myths commonly depicted on television, immerse in Singapore stories that make headlines in newspapers and challenge yourself with fun activities.Go behind the scenes and see how forensic scientists work to solve crimes. You will realise that the science learnt in school is a useful foundation to unravelling mysteries. So let's look at prints, knots, fibres, soil, blood, and analyse them to gather clues and find out who the culprit is. Along the way, you will also learn the methods to figure out how pure is a gold bar or how dangerous is an unknown white powder.Read on to discover the intriguing world of forensic science, and how you can answer the "who," "what," "where," "when" and "how" of crimes. Remember -- every contact leaves a trace!